Although Dr. Ernesto Perez credits his mother as his biggest supporter and inspiration, his brother Victor motivated him to choose veterinary medicine during their childhood in Chicago. "As children we would catch stray dogs and cats feed them and nurse them back to health," he remembers. "I specifically remember my brother showing me his biology study flash cards and stating to me, ‘When you grow up, you are going to be a veterinarian.'" While not all children obey their older siblings, in this case the message stuck. Dr. Perez earned his Bachelor's degree in Biology/Zoology with a minor in Psychology and Spanish from Western Illinois University. He went on to earn his Doctorate of Veterinary Medicine from the University of Illinois College of Veterinary Medicine at Urbana-Champaign. "The most satisfying part of being a veterinarian is relieving clients' anxiety by successfully treating their sick pet and making them healthy again," he says. 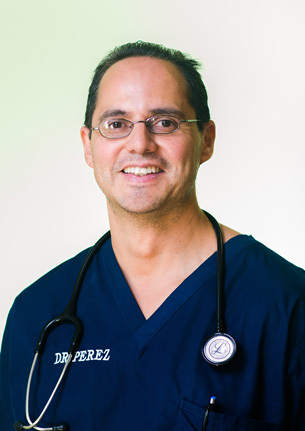 Dr. Perez is a member of the Chicago Veterinary Medical Association, the American Veterinary Medical Association and the Illinois State Veterinary Medical Association. His professional interests include internal medicine, soft tissue surgery and emergency and critical care. When not busy caring for animals at his practice, Dr. Perez enjoys spending time outdoors, specifically running, biking, hiking and swimming. He and his wife Ana Lucia De Leon have two beautiful, healthy boys, Axel and Enrique. Together they also care for their "first baby," a fawn Boxer named Bruno, who was born to Ana's dog Candi while she and Dr. Perez were dating.